This ornate and delicate nineteenth century blouse (camisa) from the Philippines made of piña cloth is a testament to the unique and rich textile traditions of this former Spanish colony. The use of piña cloth dates back as early as the mid-sixteenth century, near the dawn of Spanish rule in the Philippines. The production of the fabric is extremely laborious and relies heavily on hand processing. Piña cloth is a fabric made from fibers derived from the leaves of the pineapple plant (specifically the Red Spanish variety) that are grown and cultivated in the Visayan region of the Philippines. The leaves are hand stripped, to reveal gossamer-thin fibers that are carefully washed and painstakingly hand-knotted to create longer filaments for weaving. The weaving of piña threads is an equally lengthy process thanks to the almost microscopic width of the fibers; in fact, the warping of a sixty meter length of fabric alone can take up to twenty days. Weaving must be accomplished through the use of old looms with foot operated treadles as these delicate fibers cannot withstand most modern machine operated looms. The blouse has the characteristic shape of a traditional camisa from the nineteenth century with its wider neckline and three-quarter length butterfly sleeves. The intricate surface embellishment features alternating bands of white work embroidery with delicate drawn-work and cut-work, creating an overall rich, tonal, foliate design. Complex embroidery patterns such as this are commonly found on piña cloth; traditional pattens include organic motifs, geometric patterning and/or Spanish Catholic symbolism from colonial times. Due to the laborious cultivation, extraction and production processes that were involved in making piña cloth, the fabric was primarily enjoyed by the upper classes. During the nineteenth century, the traditional costume for well-to-do women comprised of the camisa and the panuelo, (an embroidered scarf also made of piña cloth worn over the shoulders), over full western-style skirts enhanced by petticoats [see figure 1]. This manner of dress remained fashionable until the early twentieth century. Post World War II, the popularity of piña cloth fell dramatically in favor of western fashions and fabrics. Today, piña is largely reserved for special occasions, such as high society events and government functions. Figure 1. 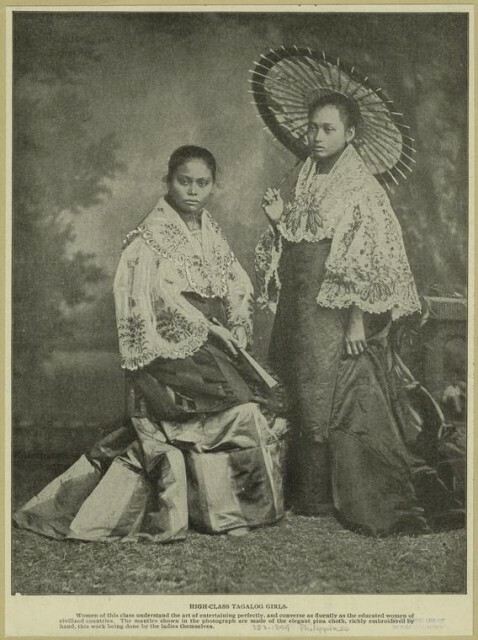 This photograph of young Filipina women from the nineteenth century shows how the piña cloth blouse (camisa) was traditionally worn in a complete ensemble. José De Olivares, Our Islands and Their People as Seen with Camera and Pencil, (New York : N. D. Thompson, 1899-1900). Kyla I. Katigbak hails from the Philippines and loves to spread the word regarding the wonderful weaving traditions of her country. She earned her BS in Fiber Science and Apparel Design from Cornell University and is scheduled to complete her MA in Fashion and Textile Studies from the Fashion Institute of Technology in May 2014.